can you upload an update patch to v1.1.1 because all my tries to update it just waste my time.And thanks to help me with my graphical issue.No issues now.Just an update one.I purchase the game on stream and unable to get the latest version since. well developers can I ask you what's the difference between the two versions v1.0.9 and v1.1.1.And does v1.0.9 contain all 7 chapters?Its the last one I want to ask. Well if the problem is in my graphic card so what alternate softwares can i use to make the complete textures.And i will try what i can do to update it.And thanks for the reply. Anyways the game is very good and I love the game play.Thanks. so any solution to fix this problem,rather to buy other system or graphic card.And how to update. And one more thing how to update my game to latest version ,I am using v1.0.9 currently.And I know that v1.1.1 is out. thanks for the reply.I think I have integrated graphics.I well does not know much about all this stuff but , I am facing this textures issue.Please help me to solve this problem.I purchase this game and facing this issue other wise the game is really good and perfect. please tell me why I am getting wrong textures? 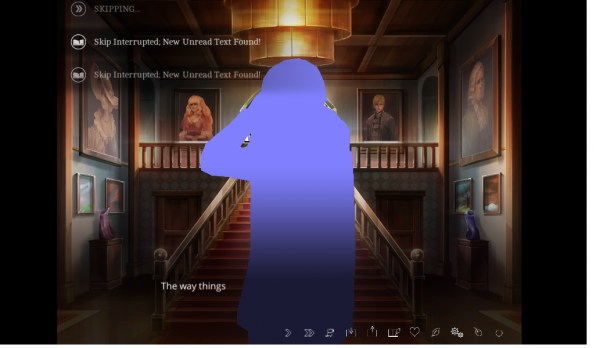 Characters like Rebecca,Ashton,etc appears blue.Please help me.The are appearing totally blue?How can I solve it?